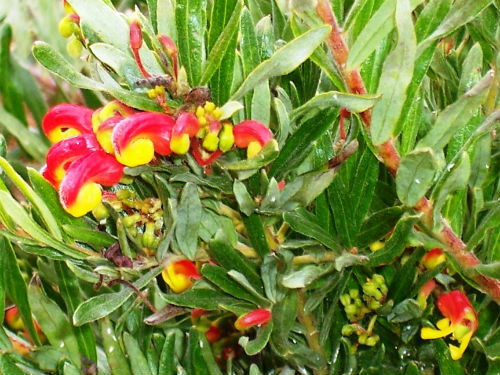 Australian Plants Society NSW - Grevillea "Bonnie Prince Charlie"
Grevillea, “Bonnie Prince Charlie” is a dwarf, bushy shrub that reaches a height of one metre. Parents, of this hybrid, are G. alpina and a form of G. rosmarinifolia and developed by Bywong Nursery. This is one many hybrid natives developed by this nursery. Oblong leaves are about four centimetres long, dark green above and paler below. Profuse and conspicuous flowers are red and yellow. They appear for lengthy periods. The blooms are similar in colour to those of G. alpina, one of the parents. Honeyeaters are attracted to the flowers. Prune lightly to promote dense growth and copious blooms. “Bonnie Prince Charlie” could be grown as a colourful foreground specimen in native garden beds.